Every week is a busy week but this one has been one for the books! Sunday morning started with a bang…we were out of the house super early to catch Serah’s family before they headed to church. Serah, our little girl born with Spina Bifida, had called earlier in the week to say she missed us and it had been too long – When were we coming to see her…and could we bring balloons, please?!? We made a short but sweet visit, loving up this very special girl, and checking in with her family of six. It is rare that we have the privilege to serve a loving family with both a mom and a dad still in the picture. Little brother John, who we call ‘Mr. Mandazi’ or ‘Mandazi Boy’ was happy we came bearing the special fried doughnuts he loves so much. This family is doing well and we are so pleased our interventions are working for them. An emergency call came in, as we were leaving Serah’s house, from our neighbors at Wana Duma Eco-Village. They had witnessed our caretakers leaving in the middle of the night taking as much as they could – INCLUDING two of my good laying hens and three of Paul’s ducks. We rushed up to see the damage. Needless to say we were shocked by both the betrayal and the loss!!! Luckily, three of our ‘big boys’ who have been helping us during the drought AND prepping the land for the solar/water project agreed to come back on their one day off(!?!?) to oversee the compound until we could get someone up there. Sadly, after a couple of days of small rains, the drought continues. That means the hand watering of our 700 trees and crops continues as well. These young gentlemen have been absolutely FANTASTIC and we couldn’t be prouder of their efforts. Two of them are waiting to join college in September with grants from the government (hopefully). The third is a very talented young man headed to tech school. They LOVE being up at out Eco-Village land (much to my surprise). Having a little break of calm and quiet time in nature beats navigating the wilderness of societal pressures and hanging out with idle friends in town (did I have this ‘maturity?!?). The week continued with caring for our sick HIV+ moms, who are so very inspiring. We almost lost two of our mamas last month. Two themes keep emerging as we support these strong young women. 1) HIV+ women have a hard time with the TB vaccines they are given, and 2) HIV+ people in rural Kenya continue to be given outdated anti-virals. These pills seem to affect their blood in a negative way. Visits to the hospital, clinic, medical counter, following up on referrals, making sure each family has the appropriate food and support fill the days. All of these things take time, care and patience. Fortunately, we have a young intern (and Wana Duma Grad) who understands exactly what these mothers are dealing with day to day. Hannah has been a huge help running between families bringing food and medicine to the moms who have been too sick to get out of bed or cook a meal. We don’t know what we will do come September when Hannah goes off to college on scholarship. It has been our great pleasure to watch her grow into the smart and strong young woman she is today. In other news, our young lad Kevin, age 19, who is in kidney failure continues to do well. We can’t afford the whole burden of his treatments but we help where we can with food and transport. 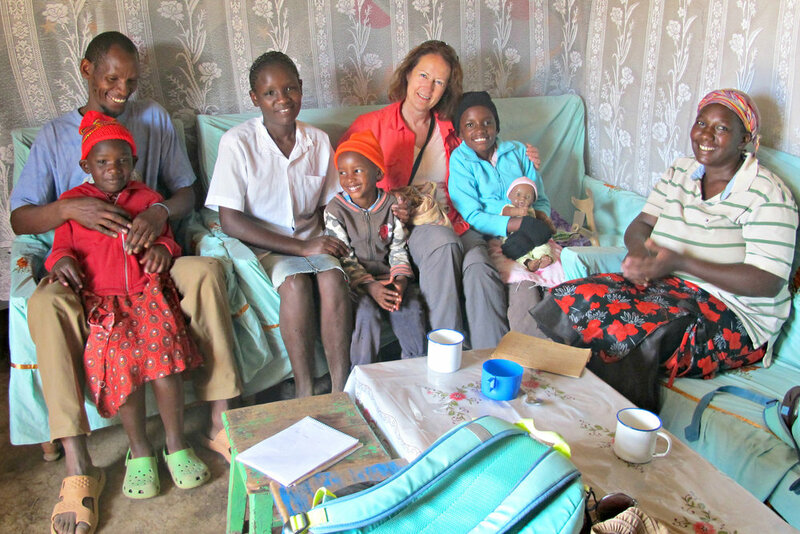 This family of ten lives in very poor conditions with all money going to Kevin’s dialysis and medical expenses. Something we can do is assist his younger brother, Shadrick, by sending him to mechanical school. In six month’s time, he will have a certificate and be able to help support the family with a good paying job. Kevin, in blue with yellow collar, is in kidney failure. This family NEVER asks for help unless they are in dire need. This morning I crossed paths with Jared, one of the younger boys. He was sent home from school for lack of fees. When I met him on the road he was wearing his tattered school uniform, without socks, clutching a couple of coins. He had been sent to the store to pick up milk for his sick brother. Finding it closed he was headed home empty handed. I brought him back to our place, filled a bag with milk, bread, and porridge along with money for school fees and SOCKS! We will keep you updated on upcoming events and news from Kenya. We respect your privacy and will never sell or share your info.